This is the finishing touch every haunted house needs! 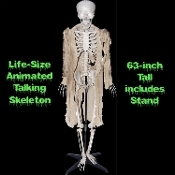 Life Size Animated Human Skeleton draped in brown gauze mounted on a stand. Skeleton is sound activated and requires 3-AAA batteries, which are NOT included. The eyes light up. 63-inch tall x 16-inch wide x 7-inch deep (157.5x40x17.5cm). Spooky skeleton has 3 creepy sayings: ‘There's something spooky out tonight and I think it's you. (Evil Laugh)’, ‘Have you come for a treat or a trick? (Evil Laugh)’, and ‘Aaahh, yet another creature of the night approaches. (Evil Laugh)’. Recommended for indoor or covered porch use only.